This funny and wise new memoir from Harrison Scott Key, winner of the Thurber Prize for American Humor, will inspire laughter and hope for anyone who’s ever been possessed by a dream of what they want to be when they grow up. Little-known author Mark Twain once said that the two most important days in your life are the day you were born, and the day you find out why. He's talking about dreams here, the destiny that calls every living soul to some kind of greatness. What Mr. Twain doesn't say is: A dream is also a monster that wants to eat you. Nobody tells you this part of the American Dream — until now. 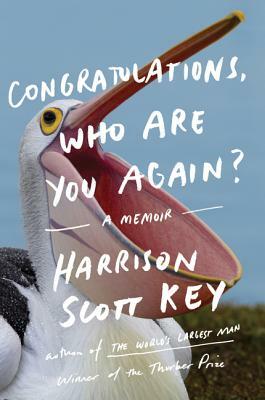 In this new memoir, Congratulations Who Are You Again, readers join Harrison Scott Key on his outrageous journey to becoming a great American writer. As a young boy in Mississippi, Harrison possessed many special gifts, such as the ability to read and complete college applications. And yet, throughout young adulthood, he failed at many vocations, until one day, after drinking perhaps too many beers and dusting off his King James Bible, he stumbled across a passage about a lonely pelican, which burst into flame inside him. In a mad blaze of holy illumination, Harrison realized his dream: to set the world afire with the light inside him. He would write a funny book. This was his dream. With unforgettable wit and tenderness, Congratulations Who Are You Again is Harrison’s instructive tale of pursuing his destiny with relentless and often misguided devotion, transforming his life beyond all comprehension: He becomes a signer of autographs, a doer of interviews, a casher of checks that are "worth more money than my father had ever imagined any of us might see, this side of a drug-related felony." On this journey, Harrison finds that as he gains the world, he stands on the precipice of losing everything that means the most: his family, his mind, his soul. Hilarious, honest, and absolutely practical, Congratulations Who Are You Again is a no-holds-barred look at the life of every ambitious human creature, whether you want to write books or make music, start a business or start a revolution. This is a book for the dreamers. HARRISON SCOTT KEY’s writing has been featured in The Best American Travel Writing, the New York Times, Outside, Salon, The Chronicle of Higher Education, McSweeney’s Internet Tendency, Southern Living, Reader’s Digest, Image, Creative Nonfiction, The Mockingbird, The Green County Independent, The American Conservative, Brevity, Gulf Coast, and Oxford American, where he is also a contributing editor. He teaches at SCAD in Savannah, Georgia, where he lives with his wife and three children. Harper published his first memoir, The World’s Largest Man, which won the Thurber Prize for American Humor. “Consistently funny…Congratulations, Who Are You Again? will have readers looking for more from this talented author.